Google Goggles Gets Text Translation: See C'est Bon! Google Goggles—the fun-to-say visual search app—now includes a point-and-click translation tool that'll take a lot of the guesswork out of your next overseas vacation. It's like having a little multilinguist living in your phone. and you'll be given the option to translate it. The app's also smart enough that it'll automatically detect the source language for you, in case one morning you wake up in a country you don't recognize. What's it good for? Menus, street signs, notes furtively slipped to you over a cappucino at Les Deux Magots. And as much as I fear this takes some of the adventure out of being a stranger in a strange land, there's definitely value in knowing that a three cheese puff salad is staring you right in the face. Can't decipher what's on a foreign menu? 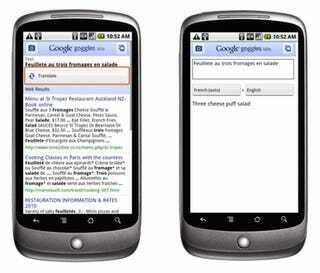 Google's point-and-click translation tool on your mobile phone solves your problem. Announced today, the newest version of mobile application Google Goggles (image recognition technology) enables automatic text translation using the phone's camera. From translating street signs to navigating foreign menus, people can now use their Android mobile devices for easy on-the-spot translation using the technology of Google Goggles plus the engine behind Google Translate. Current languages supported include English, French, Italian, German and Spanish. We plan to extend our recognition capabilities to other languages over time, including both Latin-based and non-Latin languages. In addition to translation, Google Goggles v1.1 features a larger database of recognized objects, improved user interface, and the ability to initiate visual searches using images in your phone's gallery. Point your phone at a building that takes you eye in Paris or Rome for example and be connected to search results telling you all about it.